After a whirlwind summer, I have finally have the time to participate in a DB challenge. Éclairs were chosen for August and I was excited to get my hands dirty, so to speak. Éclairs consist of a choux dough, pastry cream filling and chocolate glaze. The whole process is not hard but takes time to make sure things aren't rushed. This challenge was a huge learning lesson for me. Even with the best of efforts, the finished product ended up being disappointing. My choux ended up a little flat and eggy but the other components were great. They were still able to be sliced and filled. I'm glad I tried them, now I just have to perfect them. Thanks to Tony Tahhan and MeetaK for choosing something that we love to eat but not necessarily love to make. You can check out the DB blogroll to see what everyone else made and I'm pretty sure someone there has the complete recipe available for your reading pleasure. Here's another Bundt cake that I made recently. 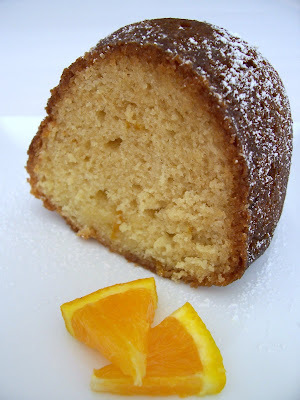 This orange cake may share the same shape as my previous cake but it is quite different in a couple ways. Firstly, the preparation method is different. For this cake, which is very delicate, you have to incorporate the whites and yolks separately. Yolks are mixed with the butter and sugar and the whites are whipped and folded in afterward. This makes for a lighter, airier cake. Secondly, the moistness and flavour of the cake are almost completely dependent on an orange glaze that is prepared in a saucepan and poured over the cake twice - once while in the pan, and then over top when it is unmolded. The recipe given for the glaze is generous and I used it all even though I didn't think I needed it. It soaked into the cake nicely and gave the cake a shiny-ish wet look and a sticky feel. One thing I noticed is that this cake didn't rise really, really high - just high enough. A light dusting of icing sugar made it look pretty. Even though the cake came out just fine, I would bake it a little less to get a lighter brown crust. All in all, the cake was not a bad one - it just had a finickier preparation than most other bundt cakes. Some may not like the sugar syrup in the cake, others may like the sweetness it gives. So as the French say, chacun à son goût! Baking with bananas is something we all do whether we want to or not. I've done it a few times here on my blog and will probably continue to do so in the future. It can't be helped - I will always have ripe bananas in my freezer waiting to be mashed and turned into something delectable. Case in point is this wonderful banana bundt cake. By using your basic pantry staples and some super-ripe bananas you too can create a perfect cake. It's moist and banana-y in just the right way. It reminds me of cakes that belong on the diner counter waiting to be sliced and distributed to hungry patrons. I, however, have not had the pleasure of growing up with diners and soda fountains but I imagine this cake would feel right at home under a glass dome. To make this cake taste its best, you must use bananas so ripe they seem like liquid and can 'pour' out of their skin. I know this sounds unappetizing, but trust me, your tastebuds will be happy. So will anyone who eats this cake. It's the best banana cake I've made in ages.